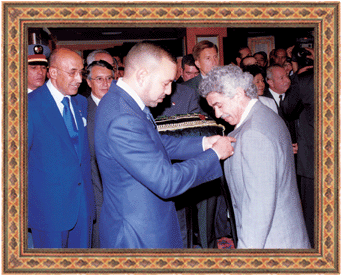 His Majesty Mohamed VI, King of Morocco, decorated Hamid Mernissi as an NGO in Morocco with a Wissam Chevalier of Al Mukafaa Alwatania (the Merit of the Nation) for his achievements and contribution in the cultural Travel programs in the Kingdom of Morocco. Perhaps your next journey will take you to a destination that captivates your imagination and touches your soul. If so, allow us to suggest the dazzling country of Morocco; a recently popular destination for the savvy voyageur. In our Tours in Morocco catalog, you will find a variety of different trips for small groups or private customized trips. As natives of Morocco and having traveled, explored, and worked extensively in Morocco, we have unparalleled expertise. We have combined our depth of knowledge and love for Morocco to create unique and exceptional tours. We plan each tour with the hope that it will foster in you, the traveler an appreciation and excitement for the magnificent country of Morocco. Each tour in Morocco affords a variety of experiences—from the spontaneous and adventurous ruggedness of the Atlas to the exquisite serenity of Fes—a city beyond time. We work diligently to accommodate each of your needs during your trip in Morocco; including the possibility to customize any itinerary as well as specific accommodations for your private tour, etc. The planning of each trip takes place in our office in Casablanca. Upon your arrival to start your tour in Morocco, you will have a first-hand experience of Moroccan hospitality. Our staff of professional drivers and guides will greet you at the airport to begin your journey. All the members of Sarah Discoveries DMC family, here in Morocco, enjoy their work immensely and take great pride in showing their country to you. Each of our guides brings a wealth of knowledge and love for Morocco, which by the end of your stay, you will surely come to share! We proudly welcome you to Morocco: a world of marvels. We look forward to creating wonderful memories with you. We specialize in cultural, adventures and spiritual tours packages. We also offer customized tours in Morocco.